Journal 1991; 302: 334-41. 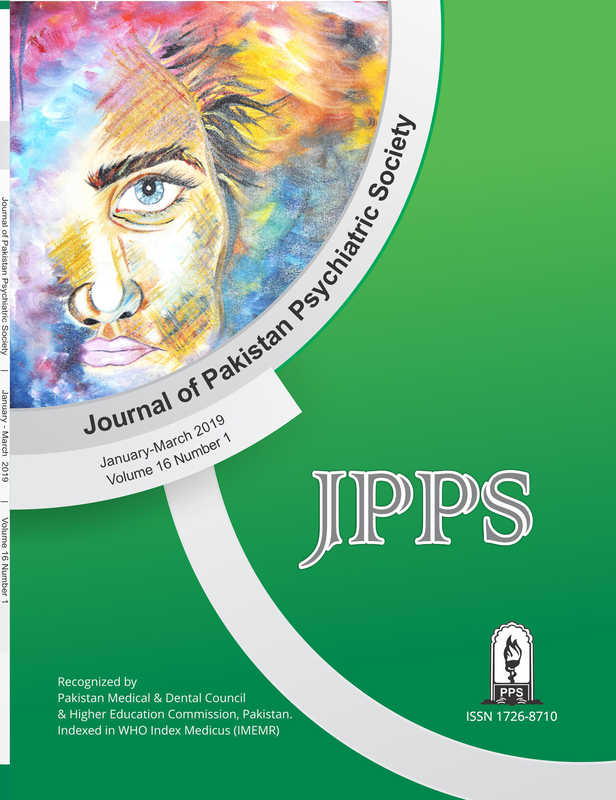 All material submitted for publication should be sent exclusively to the Journal of Pakistan Psychiatric Society. Work that has already been reported in a published paper or is described in a paper sent or accepted elsewhere for publication should not be submitted. However a complete report following publication of a preliminary report, usually in the form of an abstract, or a paper that has been presented at a scientifi­c meeting, if not published in full in a proceedings or similar publication, may be submitted. Press reports of meetings will not be considered as breach of this rule, but such reports should not be amplifi­ed by additional data or copies of tables and illustrations. In case of doubt, a copy of the published material should be included with a manuscript to help the editors decide how to deal with the matter. If tables, illustration or photographs, which have already been published, are included, a letter of permission for re-publication should be obtained from author(s) as well as the editor of the journal where it was previously published. Written permission to reproduce photographs of patients, whose identity is not disguised, should be sent with the manuscript; otherwise the eyes will be blackened out. The material submitted for publication may be in the form of an Original research, a Review Article, Special article, Commentary, Short Communication, a Case Report, Recent Advances, New techniques, Debates, Book/CDs Review on Clinical/Medical Education, Adverse Drug Reports or a Letter to the Editor. Original articles should normally report original research of relevance to clinical medicine, and may appear either as papers or as shorts communications. The paper should be of about 2000 words, with no more than six tables or illustration; short communications should be of about 600 words, with one table or illustration and no more than fi­ve references. Clinical case reports and brief or negative research fi­nding may appear in this section. Review Article should consist of structured over view of some relatively narrow topic providing background and recent development with reference of original literature. An author can write a review article only if he/she has written a minimum of three original research article and some case reports on the same topic. Letters should normally not exceed 400 words, have no more than 05 references, and be signed by the entire authors in case they are more than one; preference is given to those that take up points made in contributions published in the journal. Editorials are written by invitation. Authors should keep one copy of their manuscript for reference, and send three copies (laser copies or inkjet, photocopies are not accepted) to the editor. The authors should also submit an electronic copy of the manuscript typed in MS Word. Any illustration or photographs should also be sent in duplicate. People from outside Pakistan can also email their manuscript. Each manuscript should include a little page (containing e-mail address, fax and phone number of the corresponding author), abstract, text, acknowledgement (if any), reference, tables, and legends. Each component should being on a new page, in the following sequence; little page; abstract and atlas three keys words; text; acknowledgements; reference; tables (each table, complete with title and footnotes, should be merged in the manuscript); and legends for illustration. The manuscript should be typed in double spacing on 8 ½”x 11” (21.5cm X 28.0cm) white bond paper with one inch exceed 20 pages, excluding tables and references in an Original article and no more than 60 in a review article. If prepared on a word processor / computer, the diskette, properly protected, or CDs should be sent with the manuscript. Tables and illustration should be merged with in the text of the paper, and legends to illustrations should be typed on the same sheet. Tables should be simple, and should supplement rather than duplicate information in the text; tables repeating information will be omitted. Each table should have a title and be typed in double space without horizontal and vertical lines on an 8 ½”X 11” (21.5cm X 28.0cm) paper. Table should be numbered consecutively with roman numerals in the order they are mentioned in the text. Page number should be in the text. Page number should be in the upper right corner. If abbreviations are used, they should be explained in footnotes and when they fi­rst appear in the text. When graphs scatter grams, or histograms are submitted, the numerical data which they are based should be supplied. All graphs should be made with MS Excel and be sent as a separate Excel ­file even if merged in the manuscript. For scanned photographs highest resolution should be used. Figures and photographs should only be sent when data cannot be expressed in any other form. They must be uncounted, glossy prints in sharp focus, 5” X 7” (12.7X17. 3cms) in size. They may be in black and white or in color. Negatives, transparences, and X-ray ­films should not be submitted. The number of the ­figure, the name of the authors should be printed on the back of each ­figure/ photographs. The top of the ­figure must be identifi­ed by the author. These ­figures and photographs must be cited in the text in the consecutive order. Legends must be typed on the same paper. Legends for photomicrograph should indicate the magnifi­cation, internal scale and the method of staining. Photographs in published articles will not be returned. Reference should be numbered in the order in which they are cited in the text. At the end of the article, the full list of references should give the name and initials of all authors (unless there are more than six when only the fi­rst six should be given follow by et al). The authors’ names are followed by the title of the article; title of the journal abbreviated according to the style of the index Medicos (see “List of Journal Indexed,” printed yearly in the January issue of index Medic us); year volume and page number; e. g.: Hall, RR. The healing of tissues by C02 laser. Br J. Surge: 1971; 58:222-225. Reference to books should give the names of editors, place of publication, publisher, and year. The authors must verify the reference against the original documents before submitting the article. Every paper will be read by at least two members of the editorial board. The papers selected will then be sent to one or more external reviews. If statistical analysis is included, further examination by a statistician will be carried out. Four elements should be addressed: why did you start, what did you do, what did you ­find, and what does it mean. Why did you start is the objective. What did you do constitutes the methodology and could include design, setting, patients or other participants interventions, and, outcome measures. What did you fi­nd is the results, and what does it mean would constitute your conclusion. Please label each section clearly with the appropriate sub-headings. Structured abstract for an original article should not be more than 250 words. Review article, case report and other requires a short, unstructured abstract. Commentaries do not require abstract. Study design and sampling methods should be mentioned. Obsolete terms such as retrospective studies should not be used. The selection of the observational or experimental subjects (patients or experimental animals, including controls) should be described clearly. The methods and the apparatus used should be identifi­ed (with the manufacturer’s name and address in parentheses), and procedures described in sufficient detail to allow other workers to produce the results. References to established methods should be given, including statistical methods; references and brief descriptions for methods that have been published but are not well-known should be provided; new or substantially modifi­ed methods should be described, giving reasons for using them, and evaluating their limitations. All drugs and chemicals used should be identifi­ed precisely, including generic name(s), dose(s), and route(s) of administration.